Against the top team in the Big 12 ranked No. 18 in the country, Texas looked to be trading punches with Kansas State throughout the first half. 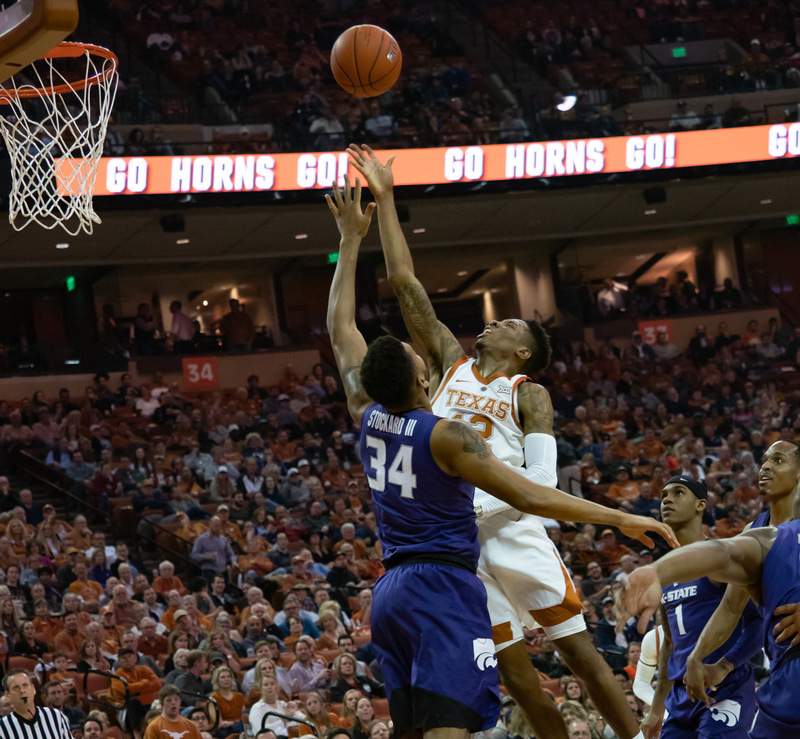 The Longhorns scored 24 of its 39 first half points in the paint choosing to eschew outside shots and instead driving against the Wildcat defense. In the second half, Kansas State decided to counter with various forms of zone defense. 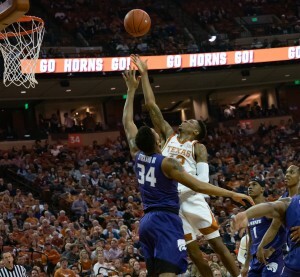 KSU head coach Bruce Weber’s decision proved to be a major difference in the game as Texas’ production in the lane was limited to eight points in the second half. Struggles against the KSU defense from all places on the court helped the Wildcats turn a four-point halftime deficit into a seven-point victory, 71-64. For as long as he has been the head coach of the Longhorns, Shaka Smart’s offensive strategy has centered around an NBA-style pick-and-roll system that utilizes athletic post players rolling to the rim off screens for driving athletic guards with players in position surrounding the perimeter to take outside shots. That system can prove effective in the NBA because of the increased quality of ball-handling and rules barring teams from utilizing zone defense. The latter restriction doesn’t exist in the NCAA, although it might seem that way watching any other Kansas State game from this season. Despite an extremely limited amount of experience utilizing zone defense – Weber said post-game he believed this was the second time KSU played zone all season – the Wildcats limited Texas to a 6-of-20 shooting performance in the second half, including 2-of-11 from three. A customary solution for teams playing against zone defense is to try to shoot over it. Big 12 Co-Newcomer of the Week Courtney Ramey hit five of his six threes in Texas’ Saturday win at West Virginia. He was held scoreless in the second half against KSU and was on the bench during the final stretch from the 6:16 point to the 0:34 mark. Smart opted to play Jase Febres over Ramey. Febres didn’t take a shot in the first half and was 1-for-3 from beyond the arc in the second half, including an air ball miss. Febres wasn’t the only guard who struggled. After a fantastic first half combining for 30 points, Ramey, Matt Coleman, and Kerwin Roach combined for 6 points in the second 20. Eleven of Texas’ 25 total points came from the charity stripe in the second half. All five Kansas State starters were in double-figures and the Wildcats made several tough late-clock shots after 25-plus seconds of tough defense from the Longhorns. The Wildcats scored 16 times in the second half and remain atop the Big 12 after avenging one of its two conference losses.